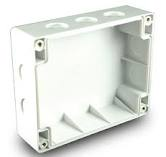 Hochiki CHQ-BACKBOX IP65 Rated Module Back Box is a weatherproof back box designed specifically for use with the CHQ "Smart-Fix" range of modules. CHQ-DRC is a Dual Relay Controller designed to provide two general-purpose relay outputs, each output can be driven separately for control of such devices as dampers or for control of plant and equipment shutdown. The monitored input can be used for local power supply fault monitoring or as a general-purpose input. The unit is also available as a DIN Rail mountable version; with or without an integral short-circuit isolator. The CHQ-DRC utilises simple DIL switches for reliable addressing. A back box is also available (CHQ-BACKBOX) which, when used in conjunction with the CHQ-DRC, increases the IP rating to IP65. YBO-R/SCI is a Loop Isolator, which is fully compatible with Hochiki's ESP analogue addressable protocol. The YBO-R/SCI Base is compatible with any of the ESP Sensors, and can be used instead of the standard YBN-R/3 Base. The Base incorporates an amber LED to show when it is isolating a section of the loop, and if used under every analogue Sensor on the loop, none would be lost if a single short circuit was to occur. The YBO-R/SCI does not use an address, and has the same wiring configuration as the YBNR/3 Sensor Base making it very simple to install.The YBO-R/SCI can also be used without a Sensor; a cover can be fitted to conceal the wiring connections..
YBO-BS Hochiki Analogue Addressable Base Sounder is innovatively designed to give a range of tones and volumes with a maximum output of up to 98dB(A) (Â±2dB(A)) with low current consumption. The unit is designed to fit to the Standard Base (YBN-R/3) or the Isolator Base (YBO-R/SCI). Hochiki YBN-R/3 is a Common Mounting Base, which is fully compatible with Hochiki's ESP range of sensors. It is supplied with square cable clamps for secure and reliable cable termination and is also capable of driving a remote LED if required. HCP-E is a Manual Break Glass Call Point, which is fully compatible with Hochiki's ESP analogue addressable protocol. The HCP-E incorporates a red LED mounted on the front cover, which can be selected as pulsing/non-pulsing for communications polling and is continuously lit when the HCP-E is operated. The unit is operated by pressing the EN54 compliant non-frangible (plastic) element and, once operated, produces a high level ESP interrupt, allowing the control panel to respond very quickly. The device can be tested by insertion of a test key in the underside of the unit. Two terminal blocks are provided for easy connection to the loop wiring. The unit is addressed using the TCH-B100 Hand Held Programmer for quick and reliable addressing and the unit can also be flush mounted if required. An optional glass element is also available. The YBO-BSB is an addressable loop-powered base sounder with integral beacon, designed to give a range of tones and volumes with a maximum output of up to 90dB(A). The YBO-BSB fits to the Standard Base (YBN-R/3) or the Isolator Base (YBO-R/SCI - from Batch Number 6044) and can be fitted with any of the ESP Range of Sensors, Beacons or Remote Indicators. The unit can also be converted into a wall sounder beacon with the simple addition of a Cap (SI/CAP). CHQ-MRC is a Mains Relay Controller which provides a single, mains-rated relay output for the control of such devices as dampers, extractors or plant and equipment shutdown. Also available as a DIN Rail mountable version, with or without an integral short-circuit isolator. A back box is also available (CHQ-BACKBOX) which, when used in conjunction with the CHQ-MRC, increases the IP rating to IP65. Model ALG-EN is a Photoelectric Smoke Sensor, which is fully compatible with Hochiki's ESP Analogue Addressable Protocol. The ALG-EN is available in ivory, white or black, the black version (with matching black base) is ideal for nightclubs and cinemas where attention to aesthetics is required. The ALG-EN incorporates Hochiki's newest High Performance Chamber Technology removing the need to use Ionisation Smoke Sensors in the majority of applications. This also allows the sensor threshold level to be increased, thereby improving the signal to noise ratio and reducing susceptibility to false alarms. The ALG-EN smoke chamber is easily removed or replaced for cleaning and utilises a unique improved baffle design which allows smoke to enter the chamber whilst keeping out ambient light. CHQ-AB Hochiki Addressable Loop Powered Beacon (Red). The CHQ-AB range consists of addressable loop-powered beacons, which are fully compatible with Hochiki's ESP range of bases. The beacons have the ability to be turned on very quickly using a group command and are synchronised to flash at the same time.